At about 500 BC, the Latin language was only spoken in the City of Rome itself and the surrounding countryside. Today 700 million people spread across every continent of the world speak a language that is derived from Latin. How did this language group spread so far? The answer lies in the military conquests of the ancient City of Rome. 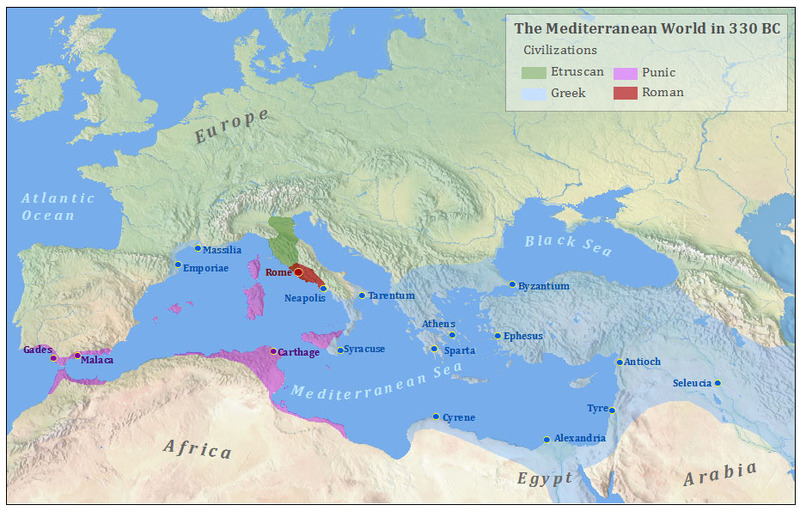 At this point Rome had transformed from one of the major powers in the Mediterranean, to the major power in the Mediterranean. It was not long before Rome would begin to expand into the Hellenistic World of the Eastern Mediterranean, conquering Greece by 133 BC (see map 5 – 130 BC), the Seleucid Kingdom in the Near East by 63 BC (see map 6 – 50 BC), and finally the Ptolemids of Egypt in 30 BC (see map 6 – 70 AD). After the defeat of the last Ptolemid monarch in Egypt: Cleopatra VII, Rome controlled virtually the entire Mediterranean. This moment also saw the permanent replacement of the Roman Republic with the Roman Empire with Augustus being proclaimed as Emperor.